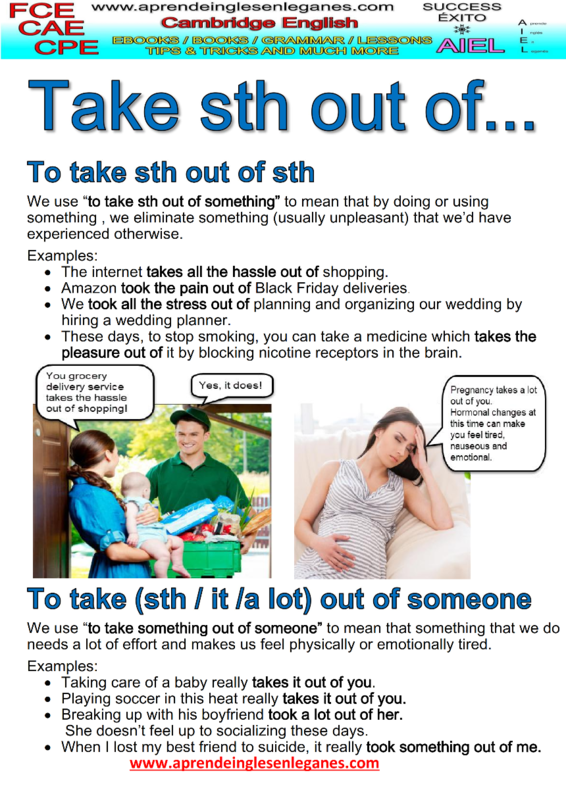 The idioms "to take something out of something" and "to take something out of someone" are similar in structure but quite different in meaning. To take something out something means that through a method or a service , we eliminate something (usually unpleasant, but not always) from something that we wanted to do. Slimsystem is easy to sit with, provides proven results, and takes the guesswork out of dieting. Technology can take the fun out of human interactions and life experience. To take something out of someone means that something that we do , needs a lot of effort to be doneand makes us feel emotionally or physically tired. It can also we used as "takes it out of / takes a lot out of". It takes something out of you to watch another human being suffer. The long walk has really taken it out of me.